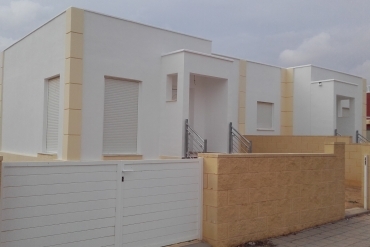 If you are looking forward to buying a home in a quiet and cozy area of the Costa Calida (Murcia), our real estate agency recommends your properties for sale Sierra Golf-Balsicas. In this city, you will have the possibility to start living your holiday period or your retirement days in the least possible way. An area where you can caress peace and tranquility. In our properties you can enjoy the Mediterranean climate like you have never enjoyed it before. Thanks to this place, it is a very quiet area, your days of sunbathing, you will enjoy them without anyone being able to disturb your moments of relaxation. The weather in Balsicas in fabulous. An ideal climate to live here during all the months of the year. Their summers are very hot, that is, perfect to fight with a good soda or a good fresh beer. Their winters are usually very calm and stable. Also, the winter months are shorter than the summer, so when you least expect it, you're enjoying the heat again. How is one of our properties for sale Sierra Golf-Balsicas? One of our brand-new properties for sale Sierra Golf-Balsicas offers a spacious home with high qualities. It contains 2 rooms and 2 toilets. The total habitable meters are 117 m2, built on a plot of 250m2. The house is second hand, but it has been built for a few years, so it offers very attractive finishes. Outside you can enjoy a beautiful pool to enjoy the most, those summer months. If you want to spend some time on the beach, surrounded by your loved ones, in just 20 minutes you can enjoy the sand and the sea. Closer is the golf course. Just 2 minutes you can have fun playing a great sport such as golf. Among other qualities offered by the house, its terrace, solarium or panoramic views stand out. Come and learn more about our real estate agency to discover all the details of our properties for sale Sierra Golf-Balsicas. Our nearest office is located in La Zenia (Orihuela Costa - Alicante). Exactly in La Zenia Golf 4B Orihuela Costa (Alicante). Our customer service telephone number is 0034 965 083 434 and 0034 678 756 648. Ask us any questions you may be concerned by phone call or email. Write to info@casasespania.com.